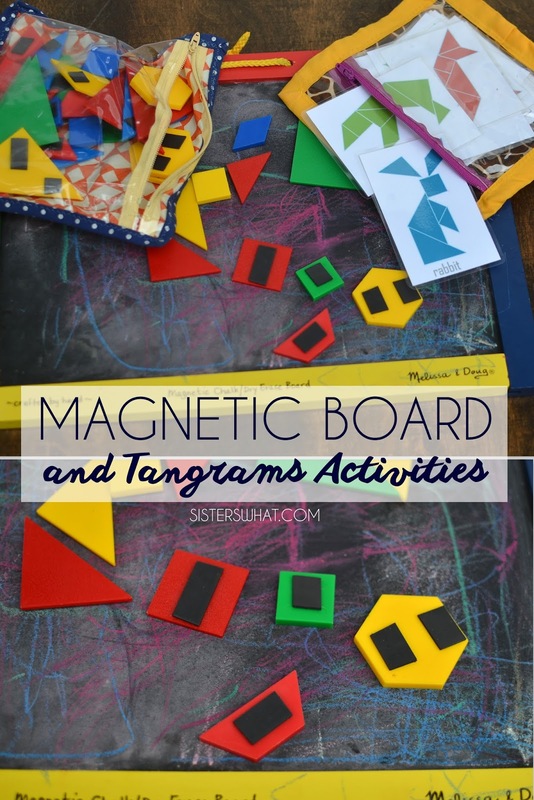 ' Magnetic Board and Tangram Activities for Kids - Sisters, What! Today is my third post sharing all the activities I put together for my 2 year old and 4 year old. I already covered the activities for my 2 year old in Toddler Activities Part 1 and Part 2, but today we're going to go over the fun stuff for my 4 year old. He was SO much easier to get stuff for because he is older and he also was entertained by the things I did for the 2 year old. Captain Awesome loves puzzles and games, so I thought Tangrams would be perfect for him. This post contains affiliate links. Thanks for supporting Sisters, What! I found a great free set of tangrams templates at Marie Pastiche blog that were perfect for Captain Awesome, not too hard. I printed them off and then laminated them so they could last longer. 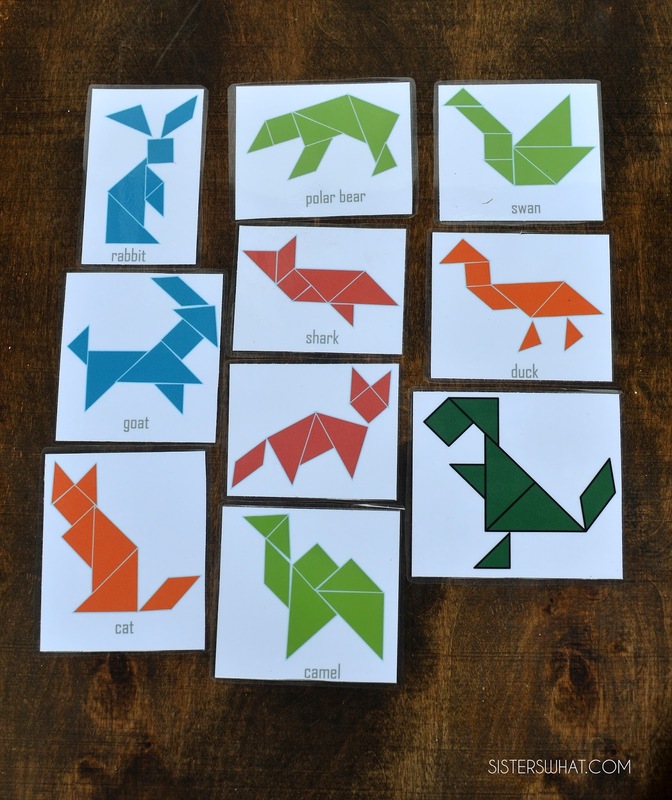 I recently bought these digital tangram cards from Little Graphics Etsy Shop and plan on laminating them as well. Seriously, hours of fun and you can find Tangrams on amazon for great prices. On the back of my tangrams, I added some Magnetic Tape. It isn't very strong but it was just enough for it to adhere and stay on the Melissa and Dough Chalkboard. 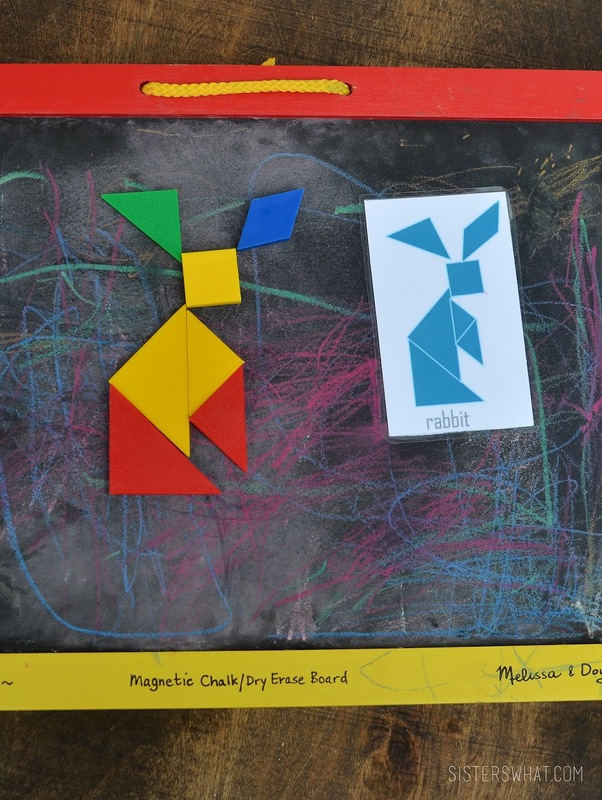 Speaking of the Melissa & Doug Magnetic Chalk Dry Erase Board . I found it on sale for $8 and thought I'd give it a try. One side is magnetic chalk and the other side just a dry erase board. Magnetic letters come with it. Like I said, the magnets didn't work super well, but honestly it was perfect for littles. 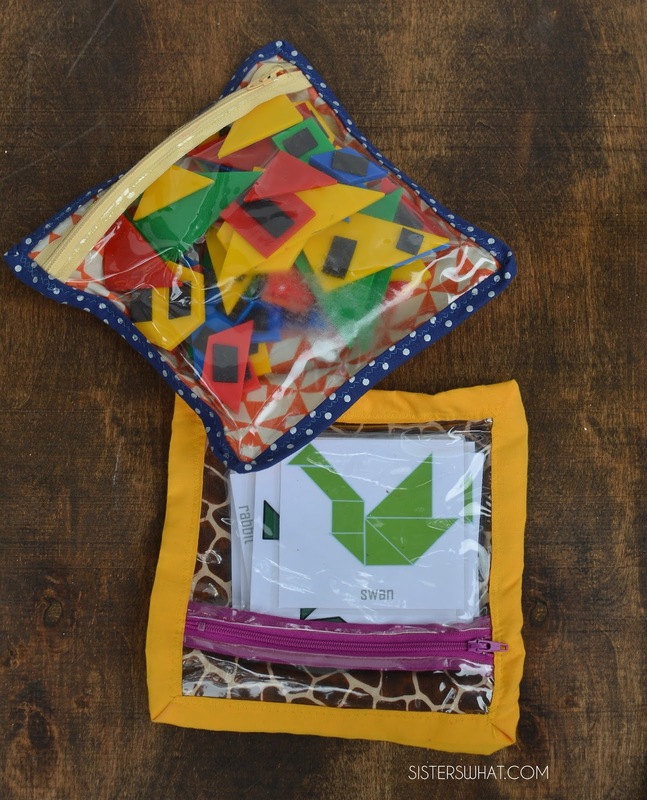 Sometimes magnetic boards are really frustrating for my little ones because they can't pull the magnets off, so this was perfect for them both. I am not a fan of dry erase markers and kids. No matter what they say on the box of a dry erase markers, non of them are truely washable. True story. However, my mom got these Crayola Dry Erase Crayons and they are awesome! I can let my 2 year old write on here with these crayons and not worry about him marking up anything within his reach. This chalk board and tangrams ended up being a great addition to the trip. Especially since it was too activities in one. 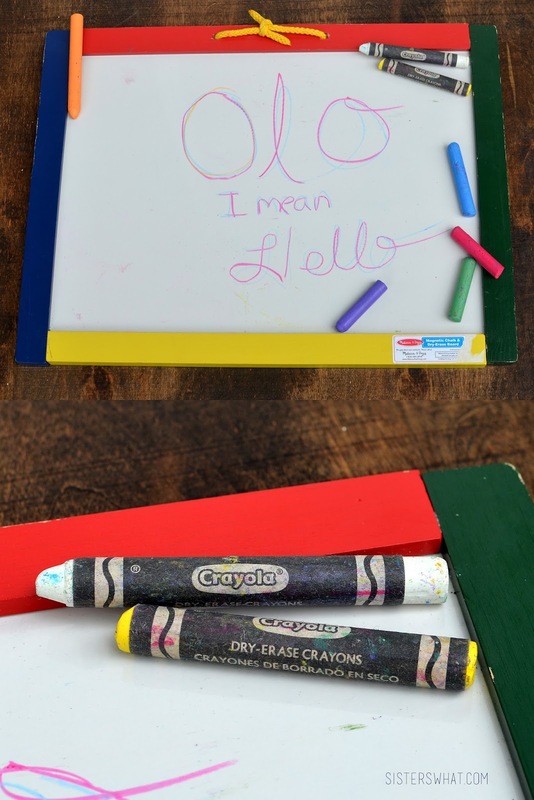 Both littles played with it and were able to use it for a hard surface for coloring books and such. Happy Traveling and Quiet time!